Power amps have always been heavy, mainly because of the massive transformers and heat sinks. Our new EPX Series amps are based on groundbreaking switch-mode technology which eliminates the heavy transformer. As a result, the amp weighs around 40% less - in fact the EPX2000 is just 22 lbs./10.10 kg, and you can lift it up almost with one finger. Best of all our super-reliable switch-mode power supply provides an even tighter bass performance as it can deliver ultra-high peak currents. 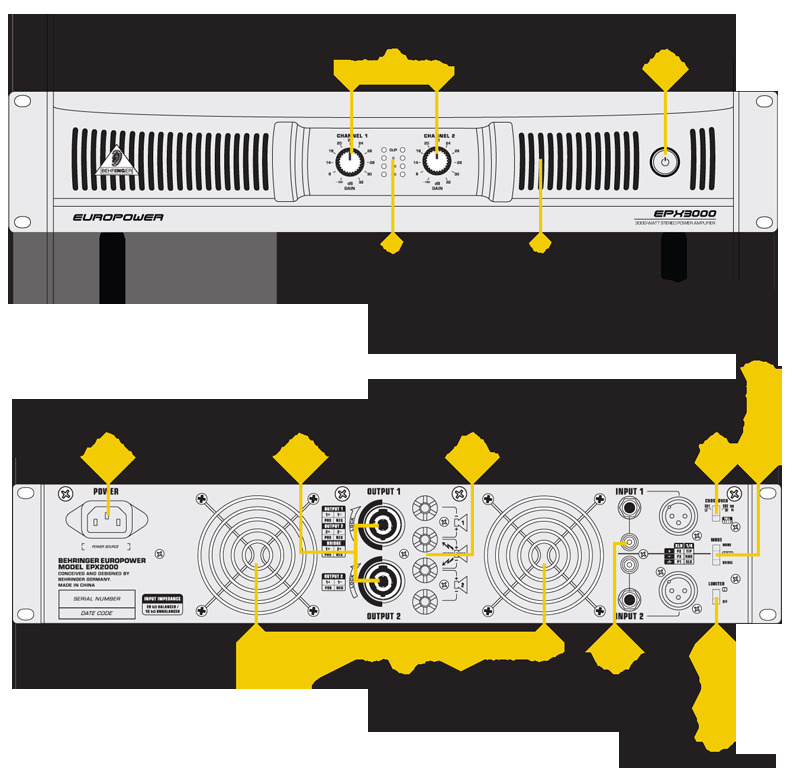 The secret to the EPX series� incredible power-to-weight ratio is their use of a switching-mode power supply combined with Class-H topology. Switching-mode power supplies work on demand. Instead of constantly working at full power and dissipating excess power as heat, they only ramp up the power output when needed�thousands of times per second. Considerably more efficient than traditional power supplies, switching-mode power supplies are small and light, yet deliver ample power. Think of a Class H amp as a car with two engines (in amps, you call them �rails�). One engine runs all the time. The other runs only when musical peaks demand extra power output. An EPX Class H amp only generates a fraction more power than is immediately needed while the output stage operates at its maximum efficiency all the time. And just like in today�s hybrid cars, the efficiency of this dual system is far greater than having one engine or rail that must operate all the time. EPX amps don�t waste power. Class H amps don�t waste power, require much smaller heat sinks and much lighter power transformers. It takes huge pulses of energy (current and voltage) to propel a woofer cone out fast enough to match a bass beat. That�s called Transient Response and it�s the holy grail of amp designers. By carefully selecting transistors with extremely high slew rates and optimizing other proprietary parts of our circuitry, our amps are able to react instantly to even the most demanding electronic bass impulses. If the woofers in your PA system can keep up, your audience will hear a tighter, crisper, more natural sound. Instead of operating relatively continuously like Class AB circuits, Class H amps, which were first described in NASA technology (U.S. patent 3,319,175), feature rail tracking for effectively modulating the power supply rails with only the peaks of the input signal. This technology has revolutionized pro audio amp designs with its outstanding performance and efficiency. When combined with switching-mode power supplies that replace heavy toroid transformers, our new designs provide more dynamic punch and, because they are so much more efficient, run cooler and don�t require huge, heavy heat sinks. BEHRINGER didn�t invent Class H technology, but our R&D Department has been working for years to perfect our own version, creating lightweight amps that run cool and also achieve our goal of Accelerated Transient Response. 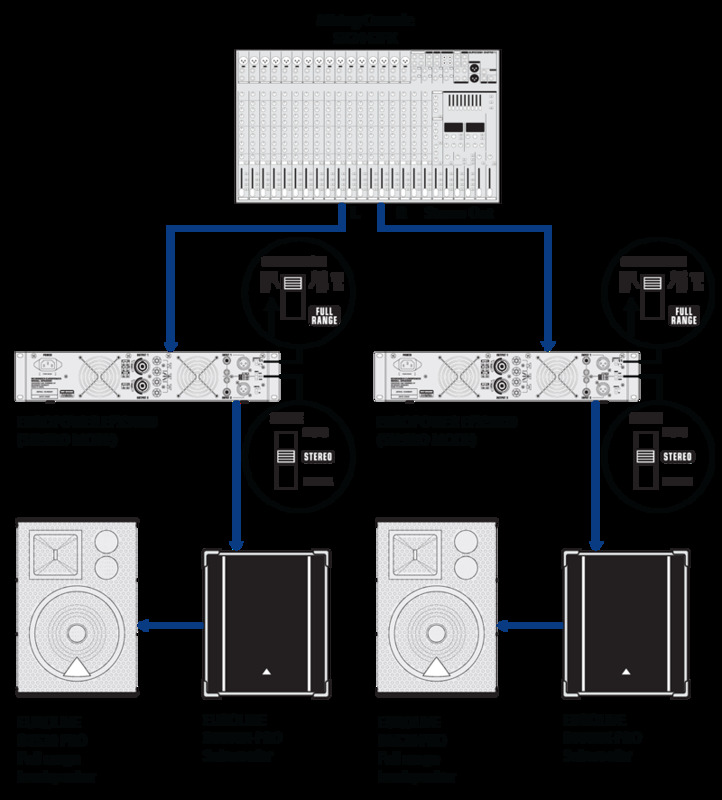 The EPX series� INPUTs accept balanced XLR, 1/4" TRS, and unbalanced 1/4" TS and RCA connections. Take your pick of professional locking speaker outputs or touch-proof binding posts to securely connect speakers. A panel of switches found on the back offers an array of cool options applicable to both channels. The Clip Limiter lets you get even more out of the amplifier without overdriving either it or your speaker system. Built-in circuitry automatically senses when the amp is being overdriven into �clipping� and then momentarily reduces the input level to avoid clipping distortion. This all happens in a few thousandths of a second, so it�s an inaudible way of avoiding audible clipping distortion. Of course, you can turn the Limiter off if you�re feeling lucky. The same panel contains the switches that allow you to put these amps to work in either mono, stereo (two-channel mode) or bridge mode, which is always in mono. A built-in CROSSOVER switch lets you select the point at which highs and lows are separated (CH1<100Hz / CH2>100 Hz or FULLRANGE). 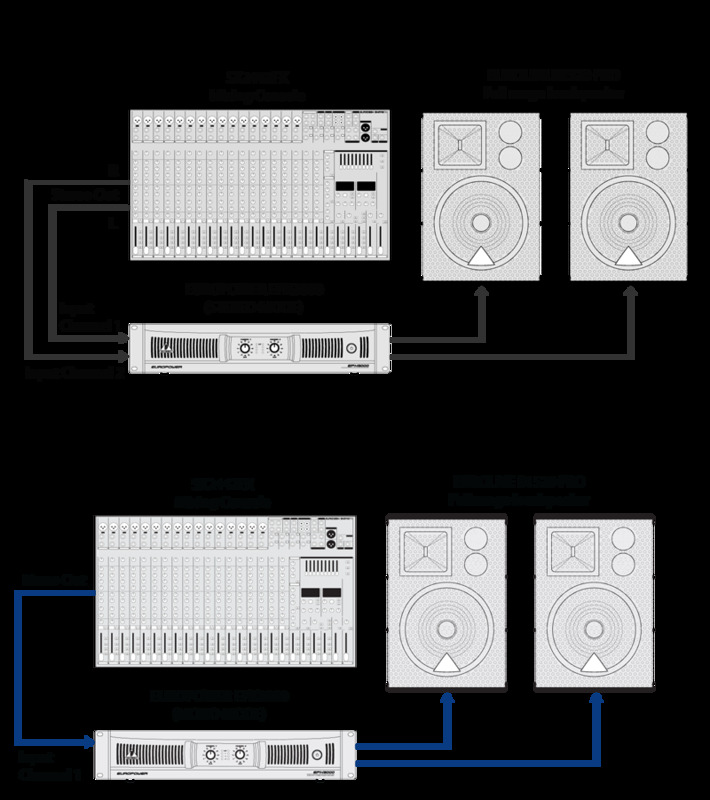 BEHRINGER�s EPX line is built for the working musician. It�s much easier to transport than a conventional AB power amp, it packs ample power, it�s got a built-in crossover and limiter, and it�s built to last through all the rigors of the road. Plus its light price tag will leave you with enough cash left over to acquire more stuff to amplify! Check out an EPX and find out why BEHRINGER power amps are among the most popular on Earth.